To Cite: Solgi E, Khodabandelo H. Cadmium and Lead Disruption in Soils Around the Hegmatan Cement Factory, Iran, Health Scope. 2016 ; 5(2):e34184. doi: 10.17795/jhealthscope-34184. Background: Soil pollution due to toxic metals released by industrial activities such as cement production is a serious problem from the standpoints of the environment and public health, because they tend to persist, circulating indefinitely and, eventually, accumulating throughout the food chain. 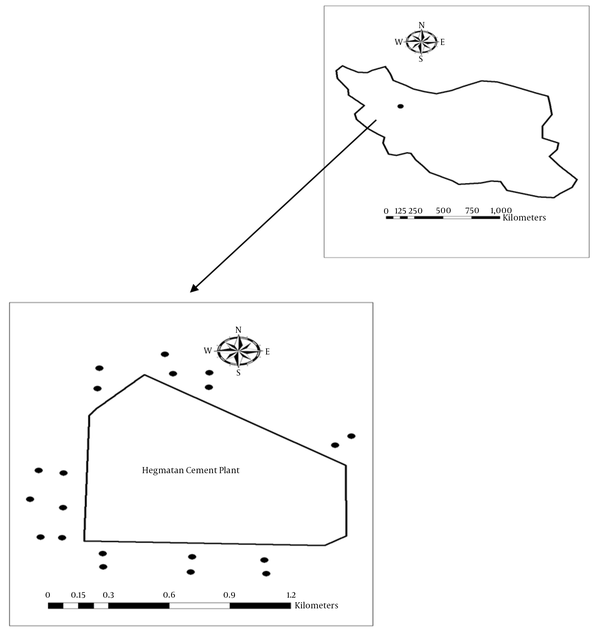 Objectives: This paper presents the results of the first research study into the distribution of cadmium (Cd) and lead (Pb) in soils around the Hegmatan cement factory, located in the Hamedan province of western Iran. Materials and Methods: Twenty instances of 20-cm depth soil samples were collected from the northern, southern, eastern, and western axes of the factory from two distances. Soil samples were subjected to a pseudo acid digestion, an HNO3, and an HCl procedure. The concentrations of Pb and Cd were detected using the AAS. Results: Based on the results of the laboratories analysis, a wide range in concentrations of Pb was found in the soil samples. The mean concentration of Pb was found to be 5.12 ± 5.74 mg/kg. The Cd concentration in soil samples exhibited a narrow range of variations, with a mean concentration of Cd in that soil of 0.13 ± 0.038 mg/kg. There were no significant differences observed in the content of Pb and Cd at different distances from the factory. Further, the results revealed that there was a significant difference between the north, south, and western sampling sites, with the highest soil cadmium concentration in the south. Conclusions: The Cd and Pb concentrations in all soil samples of the study area were less than the value of maximum allowable limit for Cd and Pb in soils, showing these metals in the studied area are considered safe. Human activities have had less influence on lead and cadmium concentration in soils in these locations. Therefore, the total Cd and Pb content found in these soils may be from parent materials. Soils act as a sink of heavy metals by serving as a place for the atmospheric deposition of particles emitted by industrial activities, such as cement production (1). The problem of dust pollution has been found to exist around cement factories (2, 3), so they key environmental issues for the manufacture of cement are the avoidance of gas and dust emissions during the production of cements, due to their harmful effect on plants and animals (4). Dust emissions from cement plants fall on plants and soils and results in the modification of soils’ properties. This may lead to physical, chemical, and biological soil degradation and affect the soil’s fertility (5). Cement dust may include pollutants such as heavy metals, poisonous gases (NO2, SO2, CO2), particulates, and dioxins, all of which may pose a threat to human health and other animals in the environment (6). The principal constituents of cement are calcium oxide, silicon dioxide, aluminum trioxide and iron oxide (7). In addition, wastes such as chromium or nickel sludge and galvanic sludge are generated during the cement manufacturing process. As a substitute raw material, municipal solid waste (MSW) is also recycled and applied as a fuel in the cement production process. The outcome of such functions is the presence of metals in the final product, cement, and in cement dust (8). Further, the main concern over the use of municipal solid wastes in the process is the potential diffusion of heavy metals that can become volatilized. Toxic metal contamination of soils can pose risks and hazards to both humans’ and the ecosystem’s health through direct contact with contaminated soil (soil ingestion, dermal contact) or indirect contact via the food chain (soil-plant-human or soil-plant-animal-human), the drinking of contaminated groundwater, the reduction of food quality (safety and marketability) via phytotoxicity, reductions in agriculturally usable land, and causing food insecurity (9). The concentration of heavy metals such as cadmium and lead in the surface soil layer is investigated in this paper to assess the extent of soil pollution near the Hegmatan cement factory (HCF). Some studies have been carried out to assess the soil pollution by heavy metals around the cement factory (3, 8, 10-16). The results of the study of Ahiamadjie et al. (11) demonstrated that elemental contents in soils around the Diamond cement factory, in Aflao, Ghana, mainly originated from activities of the factory. Addo et al. (12), in their research article, evaluated the levels of heavy metal contamination of soil and vegetation in the vicinity of a cement factory in the Volta Region of Ghana. This research indicated that the facility, which is the only industrial source in the area, is the main cause of the pollutants’ contamination in its vicinity. A study of metals around a mega cement factory in southwest Nigeria, by Ogunkunle and Fatoba (16), showed the urgent need for the bioremediation of the soil around the cement factory. The aim of this research was to characterize the influence of cement dust depositions on the total content of cadmium and lead in the soils around the Hegmatan cement factory. The Hegmatan cement factory (HCF) (35°18'43.4"N 49°12'35.3"E) is located approximately five km east of Shahanjarin village, near Razan city, in Iran’s Hamedan province. The climate is cold, with an average annual temperature of about 11°C and an average annual precipitation of 300 mm. 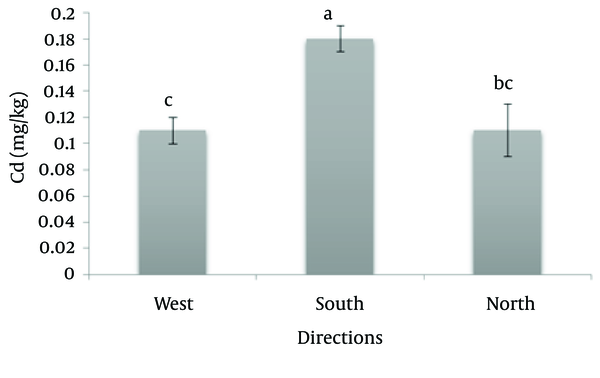 In this research, a total of 20 sites were selected at two distances (300 and 600 m) from the HCF, in all four cardinal directions (east, west, north, south, east, and west), as shown in Figure 1. Soil samples were taken at depths of 0 - 20 cm. About 1 kg of each sample was collected for laboratory analysis. Soil samples were stored in the field in polyethylene bags, and the samples were delivered to the laboratory as soon after collection as possible. The soil samples were air-dried at room temperature (27 ± 1°C) for a few days and larger particles, such as stones and plant debris, were removed. Samples were initially ground by hand with a mortar and pestle and then sieved with a 2 mm sieve in order to obtain a consistent soil particle size. Finally, portions of soil samples in the amount of 30 - 40 g were finely crushed and sieved through a 0.149-mm mesh (17). During sampling, the coordinates of the soil samples’ locations were recorded in the field using a Global positioning system device. One gram of fine powder soil sample was placed in a digester vessel, to which 12 mL of an HNO3-HCL mixture were added and then heated to 110°C for about four hours. The residue was filtered using Whatman No. 42 filter paper and then diluted with 25 mL of distilled water in a volumetric flask (18). Cadmium and lead content in the digested samples was analyzed using a Graphite Furnace and Flame Atomic Absorption Spectrometry (Younglin AAS 88020 Model). Quality assurance and control were evaluated using the triplicate and blank procedures. The precision was calculated on the basis of the percentage of relative standard deviation (RSD%), and found to be between 5 and 7%. A blank was used for each extraction batch to correct the measurements. Soil pH and EC were determined for the air-dried samples using a 1:5 soil to distilled water ratio. The suspension was shacked for two hours and allowed to stand. The pH was measured with a pH reader (model. AZ 86552), and EC values were determined with the help of a conductivity meter (model. AZ 86503) (17). All statistical analyses were performed using the statistical package SPSS for Win V20. The fitting of the data to a normal distribution for soil properties was checked with the Shapiro-Wilk test. The data were not normally distributed; therefore, the correlations between heavy metals and soil properties (pH and EC) were assessed by Spearman correlation analysis. Non-parametric Kruskal–Wallis (multiple comparison) or Mann–Whitney U tests (paired comparisons) were also used to evaluate the significance of variable differences across groupings of the data. The ranges of concentration, mean, and standard deviations at 0 - 20 cm depths of Pb and Cd in the soil samples around the cement factory are shown in Table 1. The average EC of the soil was 0.32 dS/m. The average of concentrations of total Pb and Cd in the soil collected from the area surrounding the cement factory were 5.12 and 0.13 mg/kg, respectively, as shown in Table 1. The Spearman correlation coefficients between metal concentrations and soil properties were calculated, and the results are given in Table 2. To investigate the effect of the cement dust deposition on soils in the vicinity of the cement factory, soil samples were collected in four different directions (N, S, E, and W) and at two distances (0.3 and 0.6 km) in an area around the cement factory. These results are summarized in Tables 3 and 4, respectively. The Mann–Whitney test was used between the lead and cadmium concentrations of the soils in the two distances, and showed asymptotic significance (2-tailed) = 0.24 and 0.97, respectively, and were not significant at P < 0.05 level, as presented in Table 5.
aMetal concentration (ppm), pH, and EC (ds/m) for the soil samples collected from the study area. aVariations of heavy metals for soil samples at distances of 300 and 600m. The Kruskal-Wallis test was used to test the differences in metal concentrations between different directions. The Kruskal-Wallis test results indicated no statistical differences in lead concentrations for the three directions reported in Figure 2. The contrary than for cadmium, the Kruskal-Wallis test indicated that there was a significant difference between the northern, southern, and western samples. The Mann-Whitney U test was used for a further differentiation of the directions. 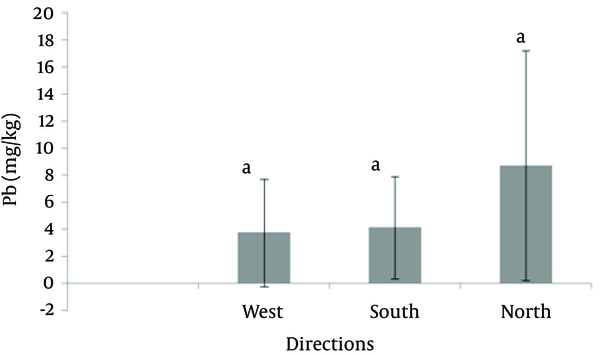 The results of this test showed that there was a significant difference between the southern samples and those taken in other directions, with the highest soil cadmium concentration in south, as shown in Figure 3. Statistical significance was determined by the Kruskal-Wallis test (P > 0.05). Statistical significance between every pair was determined using the Mann-Whitney test (P < 0.05). As shown in Table 1, soils in the area surrounding the cement factory were alkaline, with an average pH of approximately 8.97. The contaminated soil had a significantly higher pH than the uncontaminated soil (19). The cadmium and lead concentrations in the soils studied here are generally low. The Pb content in soils of all sampling sites was lower the normal range of Pb in soil (30 - 100 mg/kg) (20). Also, based on Nwajei and Iwegbue’s (21) work, the Maximum Allowable Limit (MAL) for Pb in soil is 600 mg/kg. The concentration of Cd in the soils of all sites was detectable, but also low-level. The MAL for Cd in soil is 3 mg/kg (22). The Cd and Pb concentration in all soil samples of the study area were less than the value of MAL for Cd and Pb in typical soil, showing these metals in the studied area can be considered safe and that human activities have less of an influence on lead and cadmium concentration in soils than we had assumed. Overall, the concentration of cadmium showed less variability than lead throughout the area. Heavy metals in soil typically have a relationships between them and other soil parameters. No correlations were observed between the soil’s Pb and EC or pH, but significantly negative correlations were found between Cd and EC. Also, no significant correlations were observed between Pb and Cd; this is in agreement with Mandal and Voutchkov’s (23) findings. Comparisons with other studies carried out in other countries around the world ere also shown in Table 6 (3, 10, 12, 13, 15, 23-26). These studies show that the results obtained for HCF are comparable to the concentrations of metals in Saudi Arabia. However, levels of Pb and Cd were lower than those reported for Jordan, Germany, and Jamaica. These values were higher than the values obtained by Schuhmacher et al. (10) in their study of soils around a cement factory in Spain. Other comparisons are observed in Table 6. The low levels of heavy metals may be due to the continuous removal of heavy metals by the crops grown in this area, or due to heavy metals leaching from the upper soil layer into the deeper soil layers (27) and into the groundwater (28). In this research, we observed that the concentrations of metals are highest around the cement factory. The highest concentration of lead was found in a soil sample collected from a distance of 300 m, and the lowest was from a distance of 600 m, as shown in Table 3. The highest concentrations of Pb were observed to the north of cement factory, an area of agricultural land. The highest Cd soil concentrations were seen to the south of the cement factory, as shown in Table 4. Heavy metals are mainly introduced into agricultural soils by pesticides, fertilizers, soil amendments, wastewater irrigation, and other scattered, diffuse pollution sources such as industry, traffic emissions, and incineration (3). Further, the mean concentrations of Pb and Cd in the surface soils around the factory were lower than their concentrations in the earth’s crust (Cd: 0.2, Pb: 14 mg/kg) (29, 30), indicating low contamination in the studied soils. Kamani et al. (31) expressed that the low levels of lead in urban soils may be related to the banning of leaded gasoline in Iran. The main objective of this research was to evaluate the concentration of some toxic metals and chemical parameters, such as pH and the electrical conductivity of soils collected from around the Hegmatan cement factory. In this work, two heavy metals in surface soils around the HCF were investigated. The mean concentrations of the studied heavy metals lower than the MAL values and those reported in other studies. With respect to the high concentrations of lead observed in the northern direction and, on the other hand, the common nature of winds from the north, we can say that wind direction may be effective in the scattering of this element. On the whole, the soil around the Hegmatan cement factory currently poses no risk to human health resulting from the use of crops. The need for consistency in similar future studies of the area is required, debatable. The authors thank everyone on the staff of the Kimiaye Nab Tajzieh (KNT) laboratory, in Karaj.